After losing the first leg 3-0, Juventus had to stage a stunning fight-back to have any hope of securing a place in the semi-finals. But two goals from Mario Mandzukic gave Juve a promising early lead as they attempted to void Real’s three-goal advantage. And staggeringly Blaise Matuidi wiped out Real’s lead with a tap-in from a Douglas Costa cross in the 61st minute. However, it all went downhill for Juve as they entered injury time. Medhi Benatia fouled Lucas Vazquez in the box and conceded a late penalty causing chaotic scenes on the pitch. 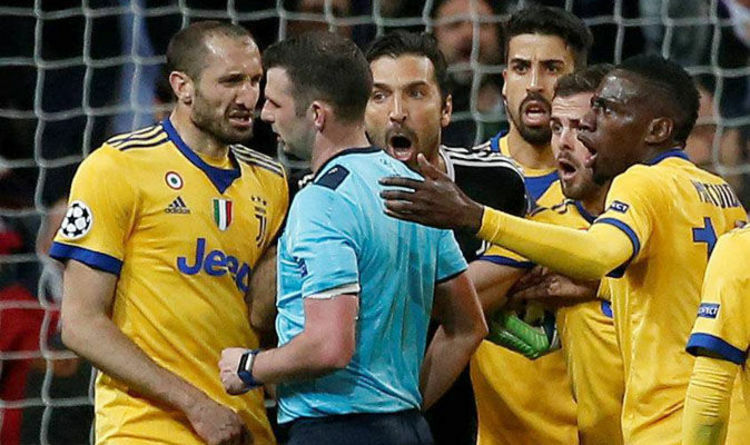 Juventus players were furious with the decision from referee Michael Oliver but none more so than goalkeeper Buffon. The Juve hero Buffon was seen rushing towards Oliver in anger as he argued with the Premier League referee. Buffon went berserk at Oliver’s decision and was quickly handed his marching orders. Juve’s substitute goalkeeper Wojciech Szczesny came on but Cristiano Ronaldo blasted the ball beyond him to send Real into the semi-finals for a record-extending eighth season. And considering Buffon has previously stated he would retire at the end of the season if Juventus failed to win the Champions League, his red card against Real Madrid has certainly put a dampener of his illustrious career.